Okay...I'm really showing my age now! 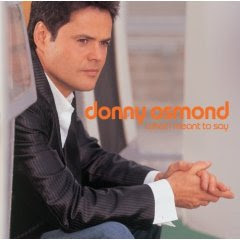 I have this CD playing now and it just takes me back to being in 5th & 6th grade when I had the biggest crush on Donny Osmond. This CD came out last year and I really like it. He still looks great! I am in my early 40's and I will confess I love Donny Osmond as well. I have this album and most of the other ones he has put out as well. My DH understands and knows that it is just something that comes along with me.